Is Nadendla Bhaskar stealing thunder of NTR biopic? Home Movies Movie News Is Nadendla Bhaskar stealing thunder of NTR biopic? Ever since biopic movies announced on NTR, Nadendla Bhaskar Rao’s name and his backstabbing of NTR again became topic of discussion in social media. Even though previous generation people clearly know what happened, current social media generation didn’t know much about him. So, they were curious to know more about him. And, because of NTR biopic movies, Nadendla Bhaskar Rao also coming out and explaining his version for all that happened in the past. There has always been a school in the past also, that argued that governor’s decision of dissolving Nadendla government was technically wrong as he had clear majority in assembly like Chandrababu had in 1994. However, Nadendla always pointed that, Telugu media projected him as villain. Now he is again putting forward his arguments cogently in the interviews given in social media. Surprisingly, video clips of his interviews are becoming viral in social media. · On RGV’s question of why NTR married Lakshmi Parvathi while there are many more beautiful women who will agree to him if he wants to marry, Nadendla answered, she served him like a maid servant and was even washing his poop and that’s why he married her. 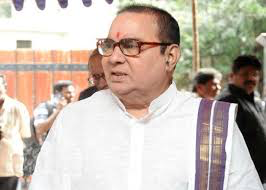 · People elected me to Lok Sabha in 1998, indicating people really do not have anything against him and only media made him villain to make NTR a hero. · I never attended swearing-in ceremony of Bhavanam Venkatram as shown in the movie. · NTR didn’t announce the name of his future political party amidst people at MLA quarters as shown in the biopic. Nadendla coming out and explaining his version is not a completely new thing. Just before 2009 elections, he released his biographical book and targeted NTR. Before 2009 and after 2009 also he came out several times. Now, because of NTR biopic movie, he is again making the same comments. People who followed his previous interviews know all these points. But only difference is – unlike earlier, now the social media became so powerful and we could see some people supporting Nadendla’s view too.